Okay. So normally, I paint really slowly. 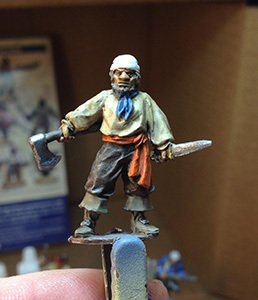 I also have a ton of minis to paint, mine as well as others! There is no way I can possibly finish all of them and still have time to sculpt. I can barely even put a dent in the mountain of minis. So I need a faster technique to accomplish this. Over the weekend, I tried a new method and here it is. It’s definitely not new to the hobby but its new to me. 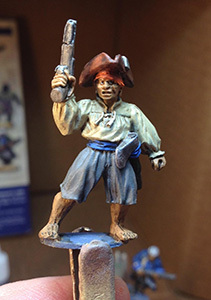 I have had these Northstar Military Miniatures pirates for quite a long time. I have wanted to paint them for a long time. 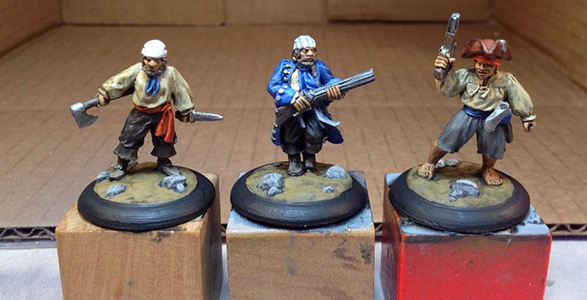 I have painted a few of them in the past, but mostly, they just stand around unpainted. They are the perfect test subjects! 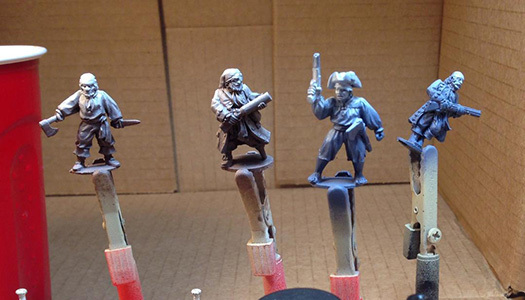 I started with a zenithal priming and pre-shading with my airbrush. I tried a couple different colors. Next I attacked the minis with the army painter technique of base coating followed by the quickshade. I have way too many paints to choose from so for this test, I limited my choices to a small set of colors. Also, I did not use the dip cans but instead used the warpaints shades in the dropper bottles. I mostly used the strong tone but also spot shaded with dark tone and blue tone just to give these a try. When these were dry, I gave them a quick coat of dullcoat so I would not chip them before they were even finished. With the varnish dry, I epoxied them to a base and then textured around them with a blob of greenstuff. Waiting for epoxy putty to harden is like watching paint dry. Boring and takes forever. So, when the greenstuff finally cured, I used brush-on primer and then painted the base. This went pretty quickly. Finally, I added a little foliage to the base and then gave the whole thing a couple more coats of Dullcoat. So, that is 3 out of the 4 models complete. Three seems to be the optimal number I can work on at a time. Or at least it was for this batch. 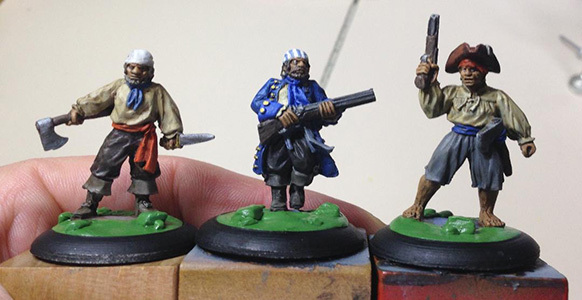 They definitely are not the greatest painted minis I have ever done, but they are not horrible either especially considering the total amount of time that I spent. Total time spent was probably 6 or 7 hours not counting waiting time. I think this is a viable method for me to attempt to tackle my personal mountain of metal. Also, I am excited that I actually completed them. I have honestly been dreading painting as it takes away from sculpting new stuff, but with this method, there might be hope for me. 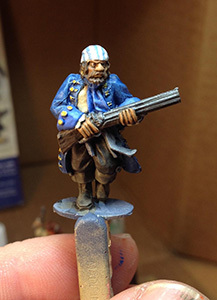 This entry was posted in Miniatures, Pirates by CaptainRumm. Bookmark the permalink.